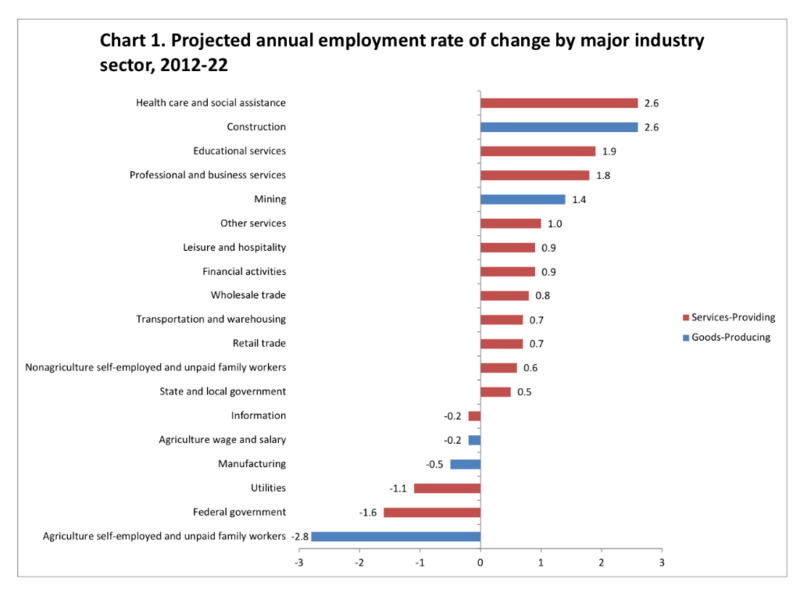 Which Careers are the Fastest Growing in U.S. Employment Projections from 2012-2022? Are you planning to study a degree subject that can provide a better prospect of employment. Before you do, you might want to consider which types of jobs are expected to have increased openings within the coming years. 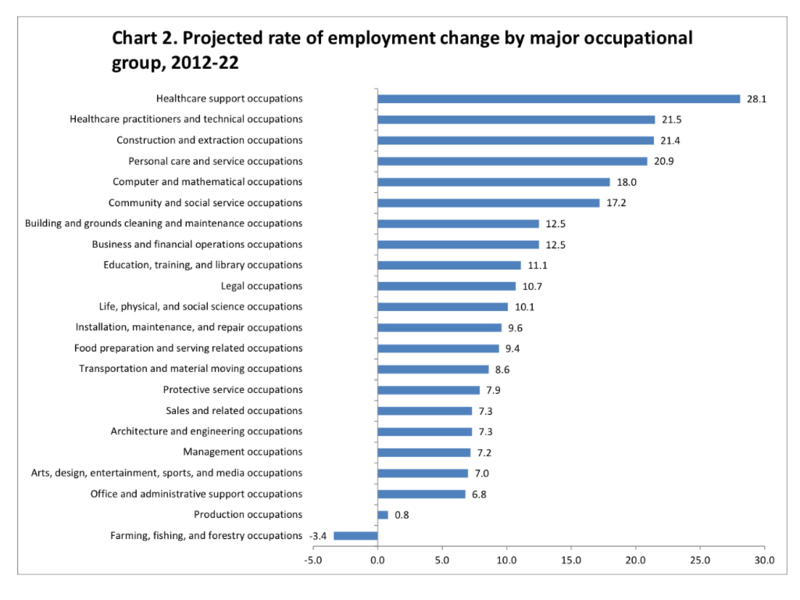 The Bureau of Labor Statistics of U.S. has comprised a list of the occupations anticipated to be the fastest growing from 2012 through 2022. Occupations and industries related to healthcare are projected to add the most new jobs between 2012 and 2022, the U.S. Bureau of Labor Statistics (BLS) reported. Total employment is projected to increase 10.8 percent, or 15.6 million, during the decade. In addition to projecting employment for each detailed occupation, BLS depicts the education, related work experience, and on-the-job training typically needed for occupations. Occupations that typically require post secondary education for entry are expected, on average, to grow faster than occupations that require a high school diploma or less. This news release focuses on several areas of projections data: labor force and the aggregate economy, industry employment, occupation employment, education and training, and replacement needs. One of the reasons healthcare is experiencing such a large growth is because, as the baby-boomer, increase of life expectancy, generation gets older and they are seeking more medical cares. Additionally, with healthcare becoming more expensive, many of the tasks that used to be conducted routinely by doctors or nurses are now being delegated to healthcare professionals who receive a lower salary, such as physician, medical, and dental assistants, in order to cut costs. The rise of demand in healthcare and social assistance sector also partly due to more individuals choose to be treated at home, rather than at hospitals or long-term care facilities. Employment in the construction sector is projected to grow 2.6 percent annually. This equates to 1.6 million new jobs over the 2012-22 decade, the most among goods-producing sectors and third most among all major industry sectors. (See and chart 1.) Despite expected fast growth, construction sector employment in 2022 is projected to be below the peak level (7.7 million; 2006). The BLS projections are used by high school students and their teachers and parents, college students, career changers, and career development and guidance specialists to gauge the prospect of employment in the coming years. Other useful reference, please click below link. 2. The 10 Fastest Growing Jobs in U.S.